Many people want to live an everyday life enjoying outdoor adventures. Alas, with jobs, families, and other pressing responsibilities, such a life can be achieved only in dreams. But for us, those responsibilities shouldn’t be a hindrance to do what you really want to do. 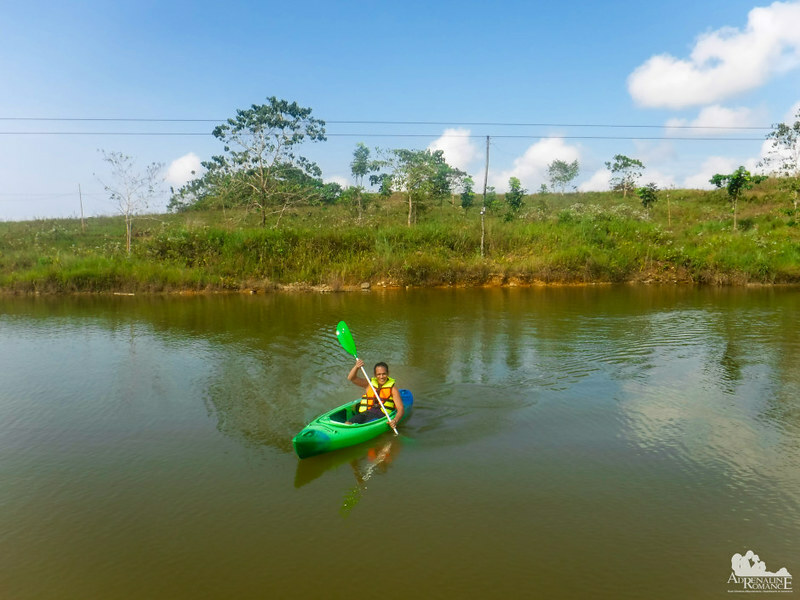 At Danasan Eco Adventure Park, you can enjoy exciting adventures! Perhaps not every day but during weekends, holidays, and days off. 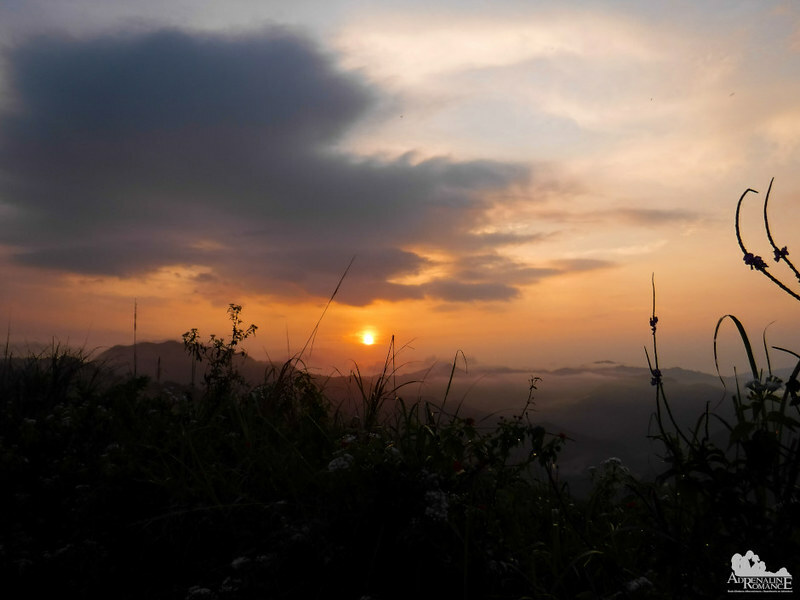 We woke up early and trekked to the summit of Danasan Peak. From there, we witnessed one of the most enchanting natural spectacles, an empyrean river of clouds that flowed through the valley far below us. Rivers and seas of clouds form when there is heavy humidity and condensation on the ground. That’s why rivers and seas of clouds are more pronounced if it was raining the night preceding the phenomenon. This aerial river somehow set the tone of this day’s cool adventure. A feeble sun peeked in the sky, its rays desperately trying to penetrate the cloud cover. We could barely fill the kiss of its warmth even as it rose higher in the sky. 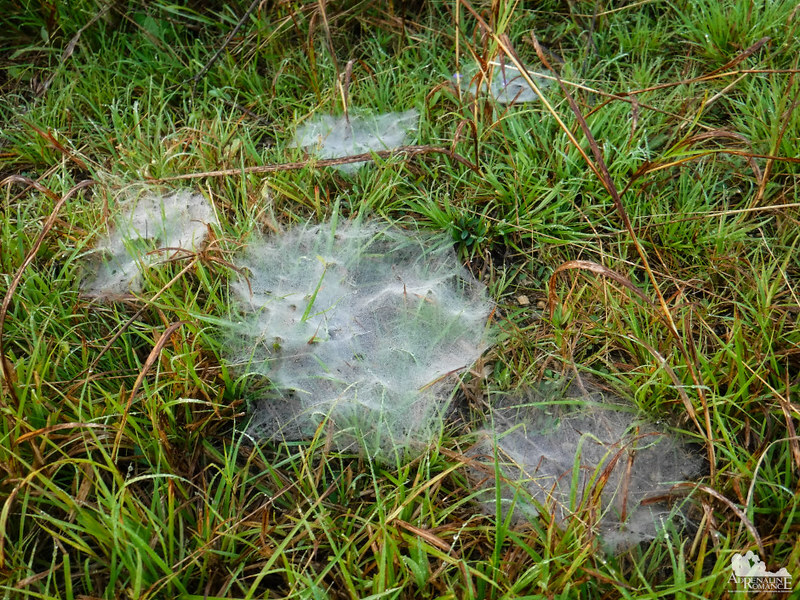 All around the peak, the morning dew accentuated the many super fine and delicate cobwebs on the ground. This is probably Nature’s version of fine silk. Beautiful! After eating a hot breakfast and enjoying a hot shower, we were ready for another adventure. 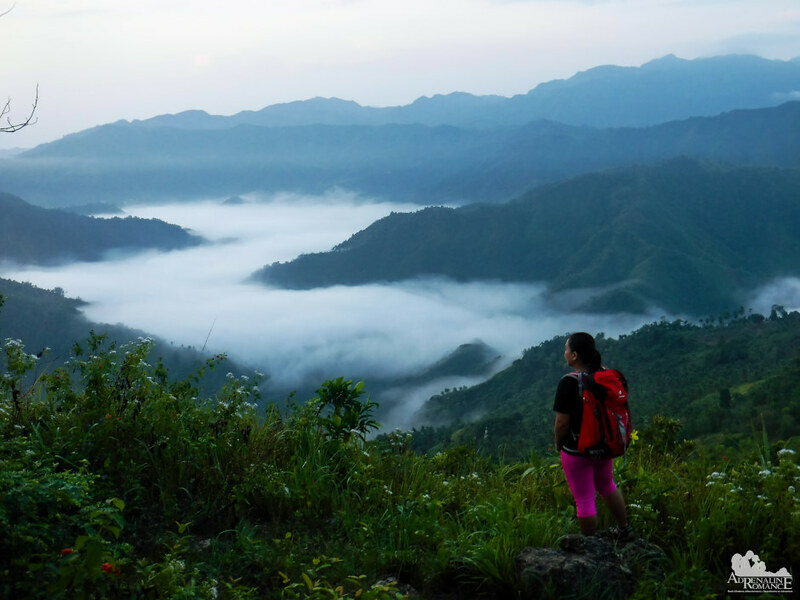 But the venue for our next activity is located outside of Danasan Eco Adventure Park and deep in the mountains. 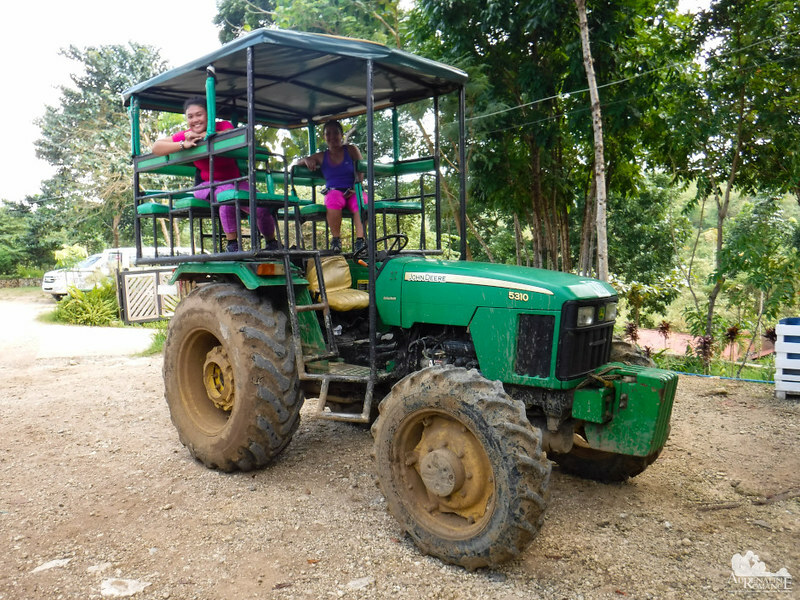 To get there, we rode on this modified tractor. Tractors are powerful vehicles that are used for towing trailers and heavy agricultural equipment. 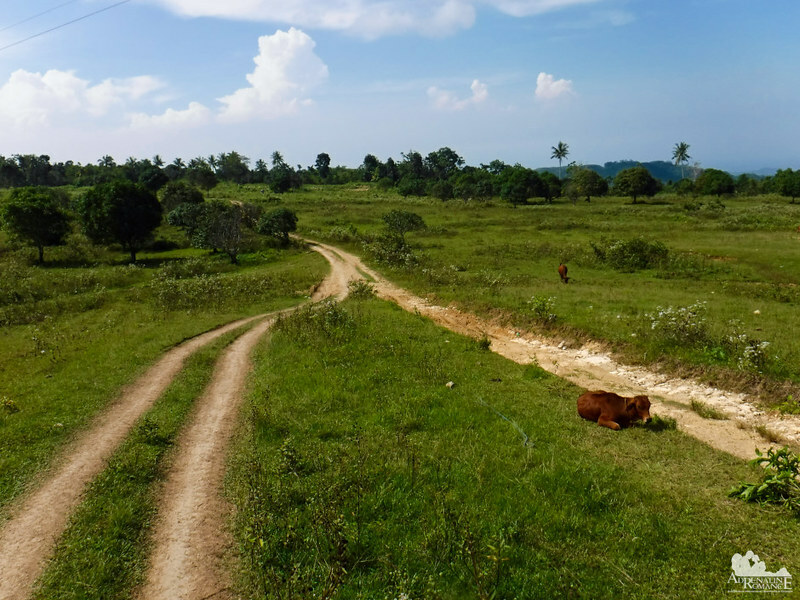 We rumbled down the road, passing the small town of Danasan, and into green meadows that preceded the mountains. Small patches of mango trees, still waiting for the right time to bloom, broke the monotony of the grasslands. We understood why a low-torque tractor is needed to get to our destination. The road—if you can call it a road—to the jump-off was extremely rocky. We reckon that on a rainy day, this road will be horrendously muddy. 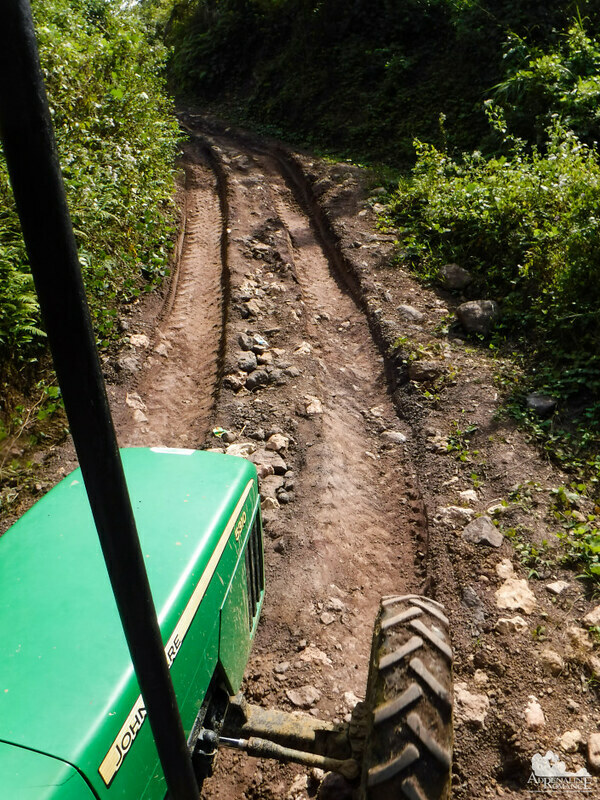 The terrain is so rough that we got tossed around in the tractor. It is very difficult or even virtually impossible to drive down this road even with a standard 4X4 vehicle or a habal-habal. The only sure way to go through here is by walking or riding this tractor. Despite the jarring ride, our team managed to get to the jump-off point relatively intact. Wasting no time at all, we walked down the trail that followed alongside a clean river. 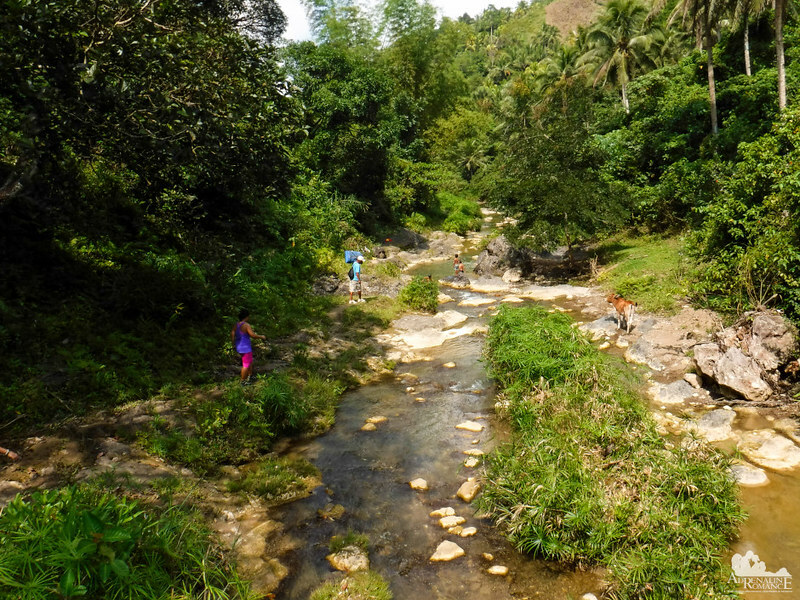 Fertile and untouched forests surrounding us at all sides gave us a reassurance that there are still beautiful and pristine places in our province. No electronic toys. No televisions. No expensive gadgets. Yet these kids were having the time of their lives. Our guides told them that every morning, they walk from their homes a few kilometers away to this river to meet friends and enjoy the coolness of the river. Now that’s real fun! 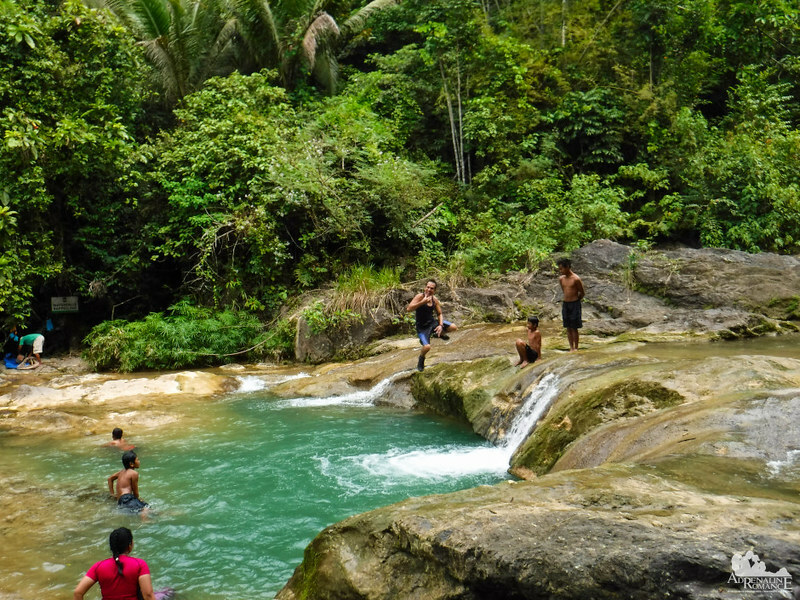 Soon, we reached our staging point on top of Busay Falls. We geared up and began to follow along the ridge of the waterfall. Local teens and kids curiously watched us, eager to see what these strange, gaily dressed visitors will do. A fixed steel cable 50 feet above the ground—which we first thought was a power line—spans the river. We need to cross using a method called a Tyrolean traverse. It’s as exhilarating as it is exhausting. Commonly used by rock climbers, mountaineers, rescue workers, and military personnel, a Tyrolean traverse involves crossing a free open-air space between two high points using a rope or cable. First, you are attached to the line using a combination of climbing harness, pulleys, and webbings. Then you use your own hands and feet to move across the line. It’s quite a physical activity, especially if the line angles upwards. Also, you need to make sure your hand or fingers are out of the way of the pulley as you move along the line. If you have been in an adventure park, then you might have done a Tylorean traverse all along without knowing it. A zipline is actually a kind of Tyrolean traverse, but rather than using your own power, gravity itself helps you travel quickly along the line. 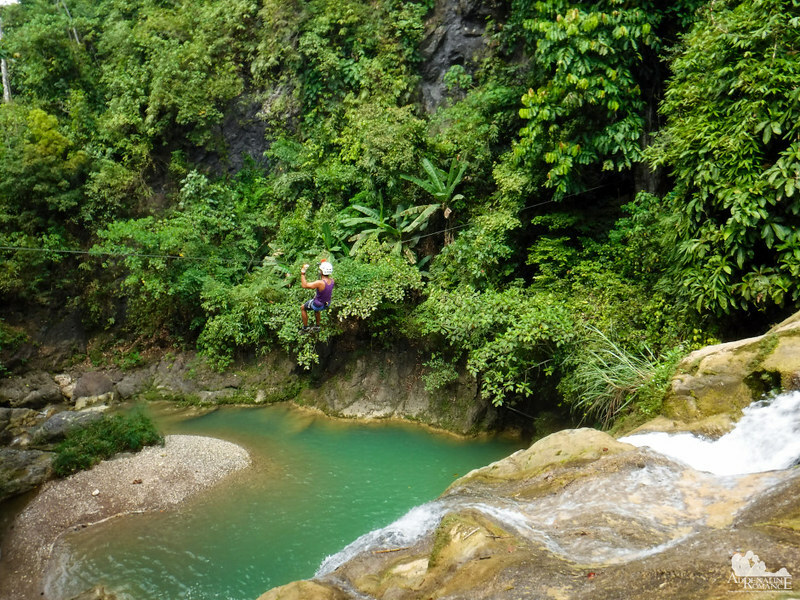 After crossing the chasm, we prepared for another adventure—rappelling down the 50-foot Busay Waterfalls. At first, we were quite apprehensive about the rappel setup; the anchor was two flimsy tree trunks above the waterline. We would have preferred hangers that are bolted directly on the rock, but we trusted our guides. Besides, we are not exactly heavyweight so the anchor can definitely hold us. 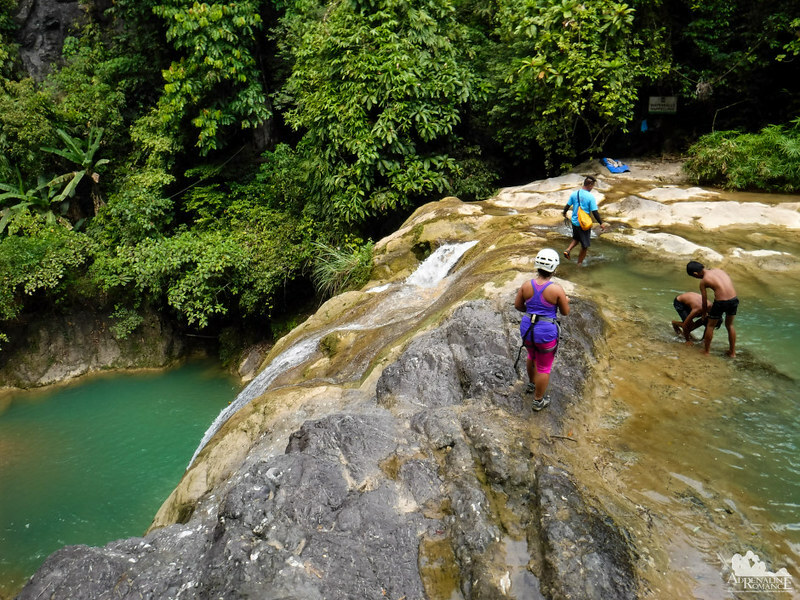 Carefully, we made our way down the lip of Busay Falls. 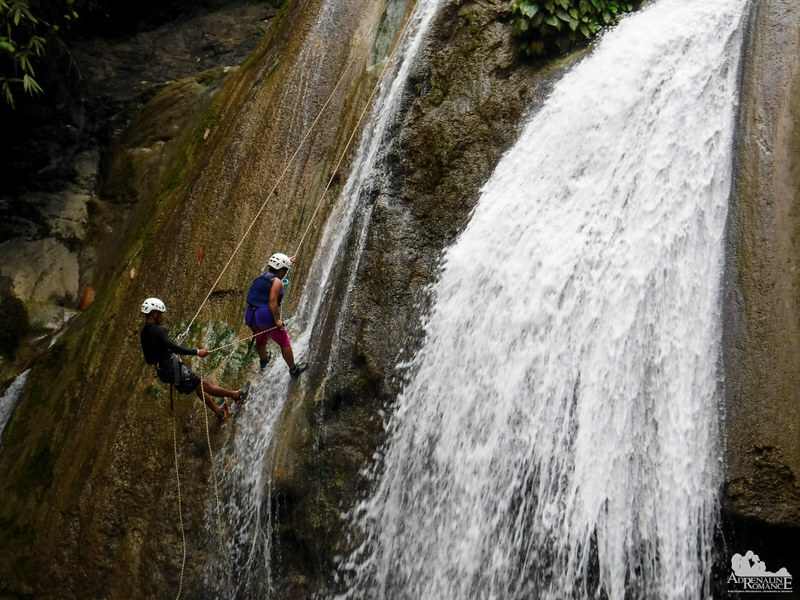 With our accumulated outdoor experience, we can definitely rappel down the waterfalls ourselves. But out here in the wild, safety is always paramount. Thus, a guide accompanied us while we made our way down the line. This is an ideal setup for first-timers. The guide can assure, encourage, teach, and watch over abseilers as they go down. Novice abseilers are also comfortable and confident, knowing that there’s a guide to help them all the way. Almost there! The natural pool below the falls is sufficiently deep. So even if you lose control of the rope and fall down, you can still escape a hair-raising ordeal with barely a scratch. 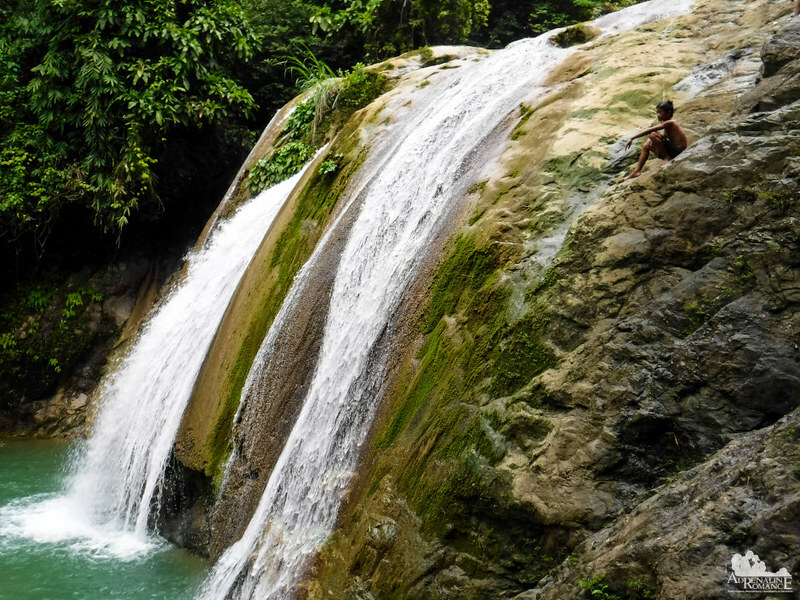 Just to give you an idea of how tall Busay Waterfalls is, check the photo below. 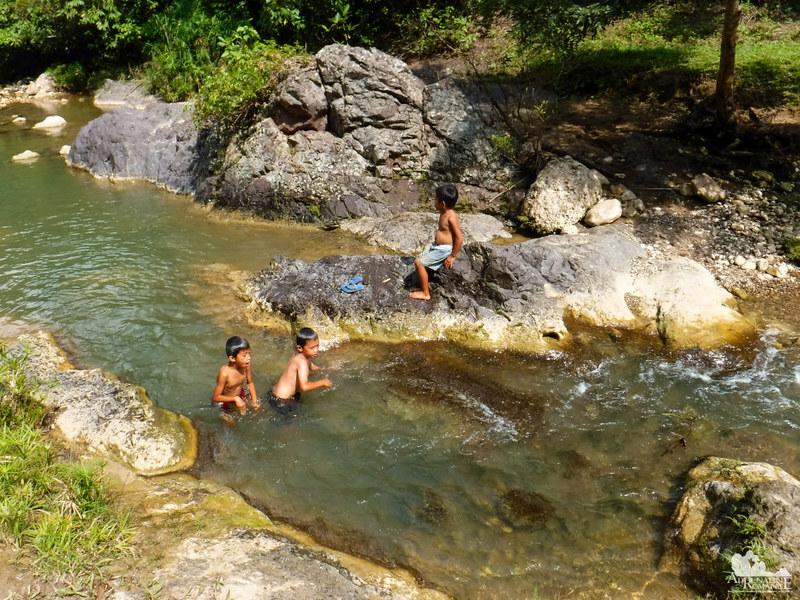 Our hearts skipped a beat looking at that young kid sitting on a precarious and slippery ledge. But he seemed to be nonchalant about it. Alexa and I joined in the fun with the local boys. And some of them stole glances at our pretty teenage daughter. Hehehehe! A few other guests arrived to try out the rappelling and the Tyrolean traverse activities. 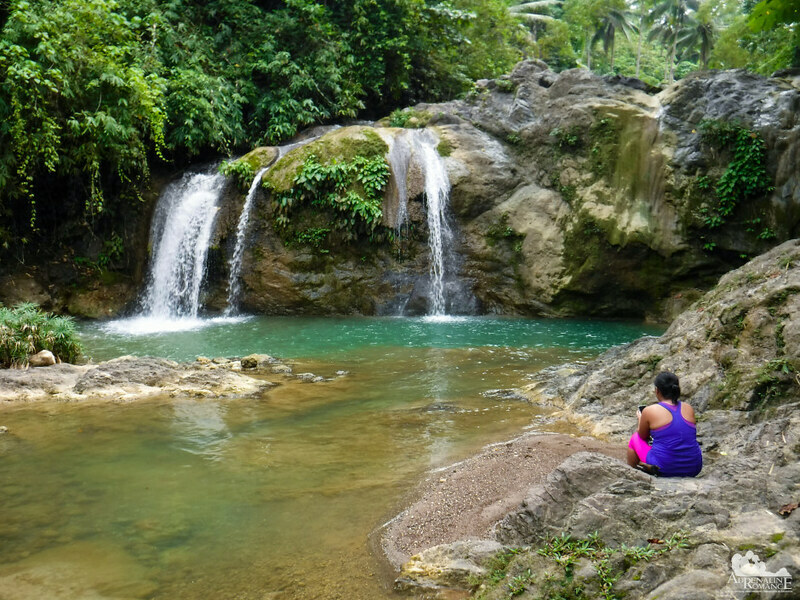 While waiting for them so we can return to the park together, we took some quiet time to explore and relax at the upper tier of Busay Falls. Nature is an effective mental and spiritual masseuse. Just looking at natural scenes like this cleans the mind and refreshes the spirit. We arrived back at Danasan Eco Adventure Park just in time for a late lunch. Then we rode the shuttle truck to one of the park’s most popular attractions—the wakeboarding pool. Steel cables with motorized pulleys cross along the 60-meter pool. The pulleys are speed adjustable, so the pool can be used by beginners, amateurs, and experts. I don’t have a good sense of balance, so it took me some time to be able to stand on the board. Bend your knees, don’t twist the board too much, don’t pull on the handlebars, etc. Soon, I was able to stand on the board and skim the surface. I still can’t do the simplest maneuvers let alone make high jumps across the wake. But even skimming at high speed across the man-made lake is incredibly fun! I’m definitely going back here to train! After we had our fill of wakeboarding, we hiked to the adjacent artificial lake that is used for kayaking. A floating pier provides easy access to the moored boats. One of the nice things here is that there is a variety of boats you can choose from, not just kayaks. There are also fiberglass canoes and catamarans. 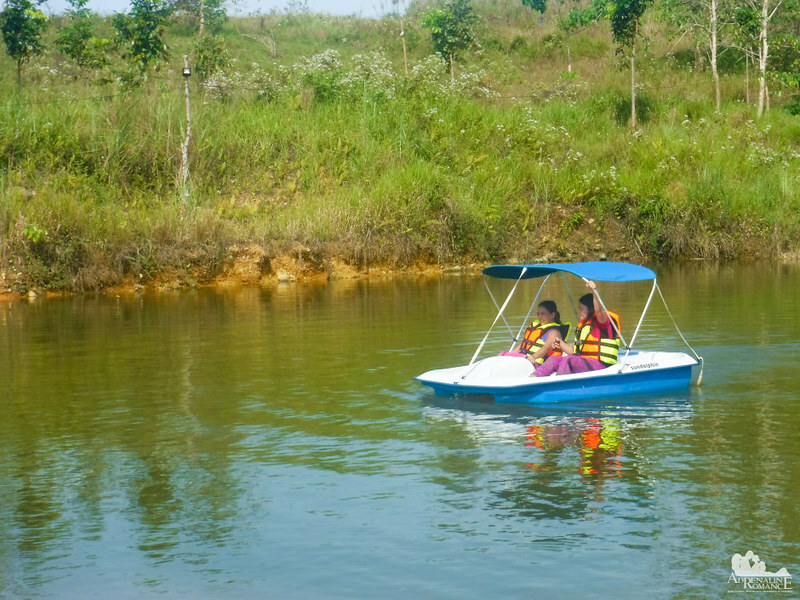 In the photo below, Sweetie and Alexa enjoyed a pedalo, a recreational watercraft powered by the action of pedals turning a propeller or a paddle wheel. Moving it around is quite a workout for the legs though. Want a physical workout that is both relaxing as well as invigorating? Then paddling a kayak will do the trick. I paddled across the pool until my arms screamed for me to stop. Whew! Our weekend was over, and in the morning, we’ll be back to our standard everyday routine. But the activities we did in Danasan Eco Adventure Park definitely filled us with an all-time adrenaline high. The park is definitely an ideal place where individuals, couples, families, and friends can have a rush of excitement and adventure in the space of a weekend. 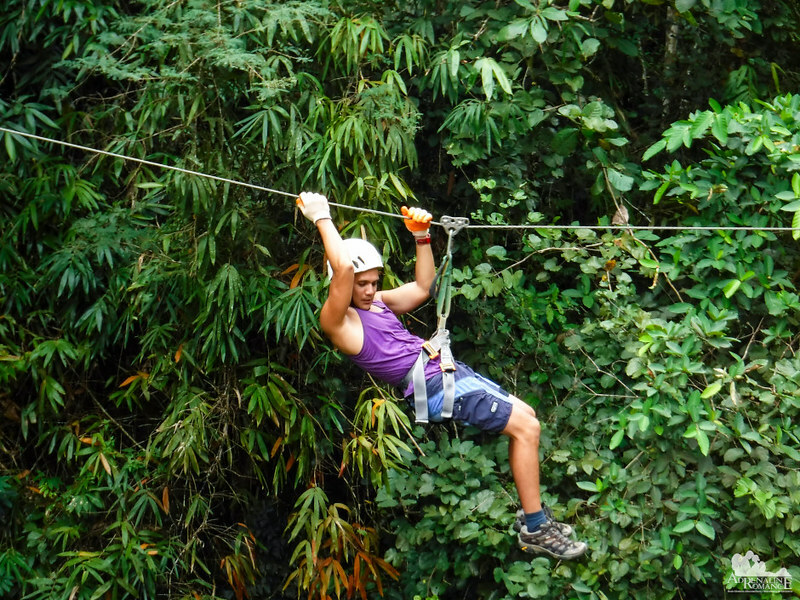 Live beyond your comfort zone, and unleash your adventurous side! As a finale, check out this simple and short video of our adventure in Danasan Eco Adventure Park. 1. 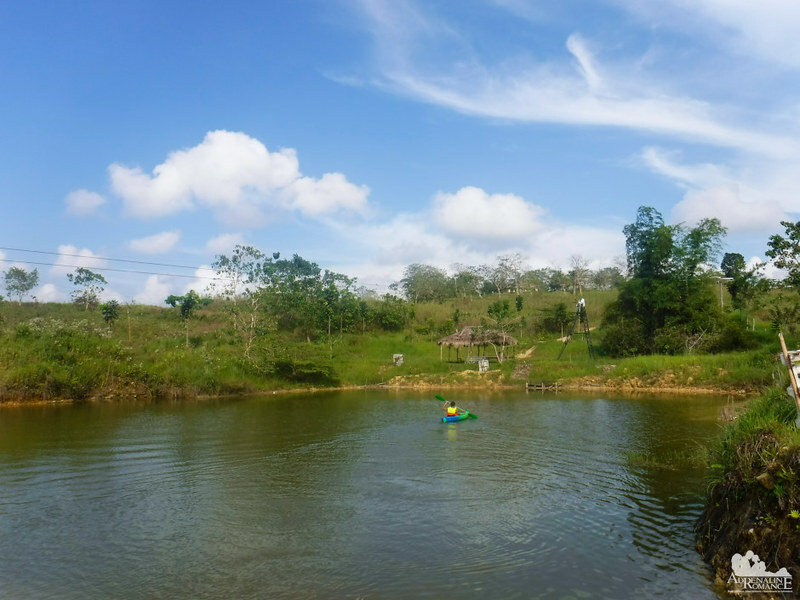 For contact details and information about the park’s facilities, check out Part 1 of our Danasan Eco Adventure Park series. 2. For in-park activities, rates, and adventure packages, check out Part 2 of our Danasan Eco Adventure Park series. 3. Start your activities early. The earlier you begin, the more adventures you can try out, and the longer you can stay and enjoy in any one activity. 4. Wear comfortable clothes such as tank tops, rash guards, or dry fit shirts (we recommend Se7en Outdoor shirts). Don’t forget to bring your swimwear if you plan to try out the wet activities. 5. For safety, always follow the guide’s instructions. For example, don’t do high jumps unless he tells you it’s safe to jump. In addition, always listen attentively to briefings, instructions, and explanations on equipment usage. 6. We strongly recommend you order your meals beforehand because they are prepared and cooked as ordered. By the time you return from your adventures, your food is piping hot and ready for serving. 8. 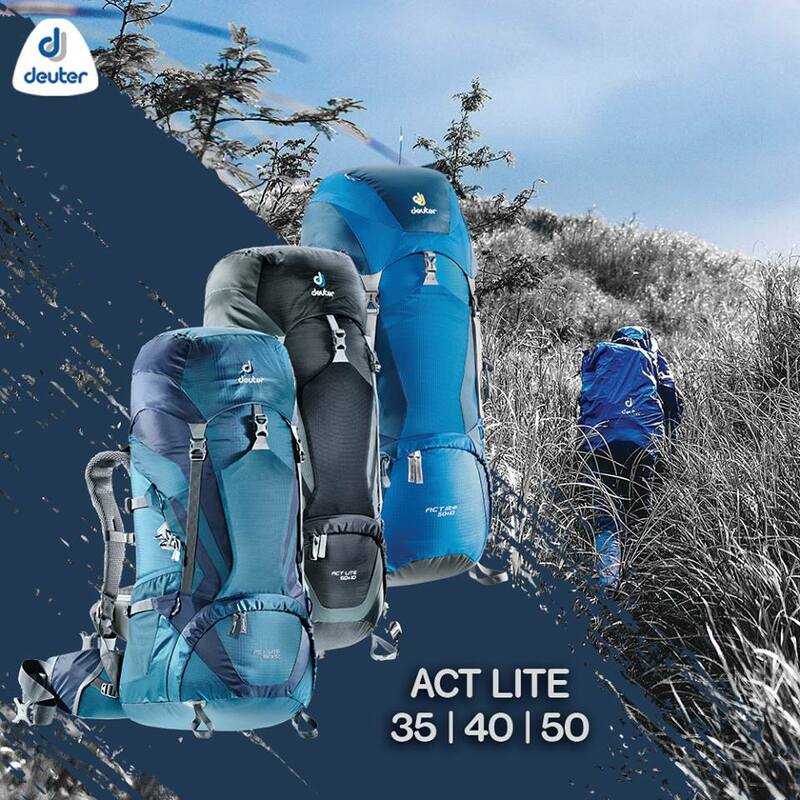 Waterproof your belongings by putting them inside a plastic bag, a zip-lock sandwich bag, a waterproof casing, or a Lock N’ Tite tub before placing them in your backpack. 9. Observe the Leave No Trace principle. Do not litter. This looks so much fun! We’re definitely going there to try wake boarding and that Tyrolean traverse. I really admire you and I enjoy your blog … keep up the GREAT work/fun! That looks incredible. Added to the “must but probably can’t” see list. I’m in a tricky situation. If I leave Brasil, I can’t get back in unless I’m married to a Brasilian, at which point it would be tough to find the time and money to travel there, not to mention I would be choosing that over seeing family that year. So I guess I could do those things, but it would be a major disruption in my life where I would lose, friends, jobs, an apartment, and my residence. Wow, that’s adrenaline rush activity! So much beauty and so much fun!!! I hope someday I can…thank you! Wow! Such a great place for hiking. I love the scenery and the landscape. When’s the best time of the year to go hiking there? Yup, it’s a really nice place. You can visit any time of the year; most of the activities in the park are available even in bad weather. Definitely, the waterfalls is closed during rainy weather due to the risk of flashfloods. reading you article made me miss adventures. I would love to try kayaking, but i am so scared as i am a terrible swimmer. Loved the pictures from the waterfall! You’d minimize the risk (and feel confident about yourself) if you wear a PFD/life vest whenever you do watersports. A must visit! 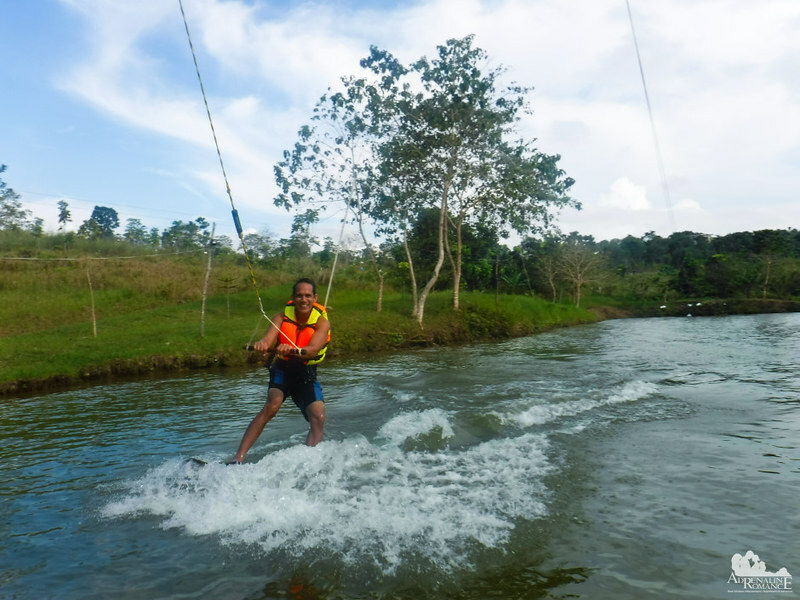 This is definitely for a thrill seeker and for those people who are looking for more adrenaline pumping activities and adventure. Indeed! There are so many places to visit here in the Philippines! Wow, so many adventures to be had in this eco park! 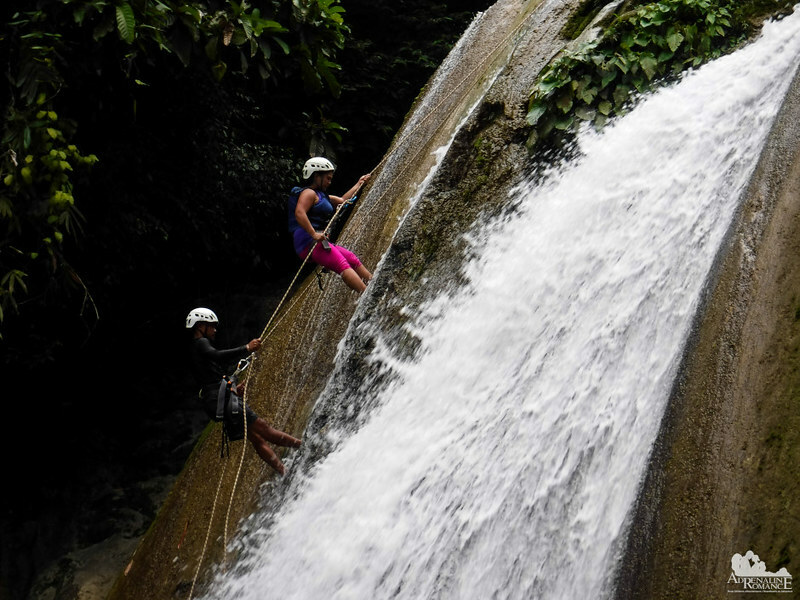 Waterfalls, kayaking, rappelling – what an incredible place to visit for adrenaline junkies. I totally understand why you guys had to go in that tractor as well, the road is crazy rough! I had butterflies in my stomach after reading this! Your adventures are always adrenalin filled and so much fun too. This park is stunning, and so nice as you’re surrounded by nature too! It’s really fun. The nice thing is that you get to have a lot of fun while appreciating the beauty of nature. These activities look sooo fun! Of course half of the stuff would happen without me – I don’t see myself crossing waterfalls on a shoe string 😉 But the landscape and the waters look just beautiful – maybe I’d find less adventurous activities there to enjoy it!? Wow. This is only for the hard hearts. But I’ll love to see how hard my heart is at Danasan Eco Park. And there’s so much to do for the adrenaline soul. 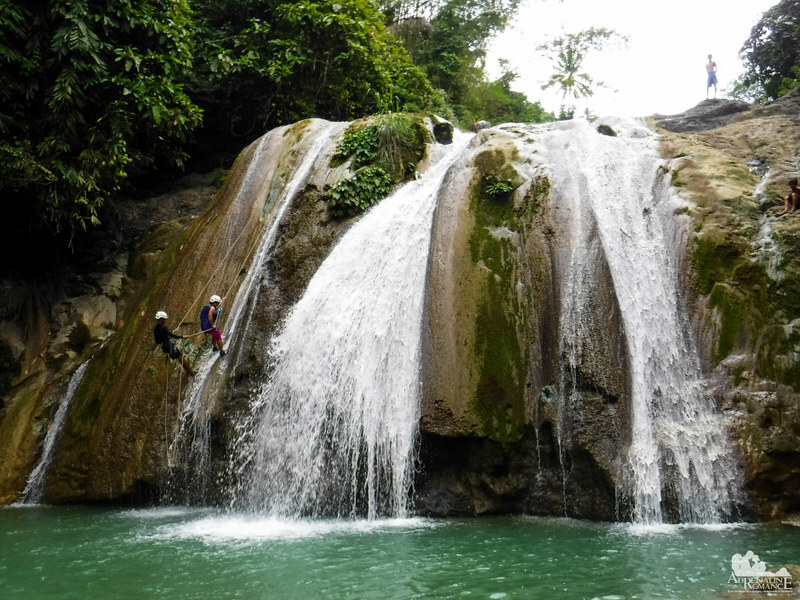 I’m so excited to try Waterfalls Rappelling. And nice pictures you have here too. This looks like so much fun. 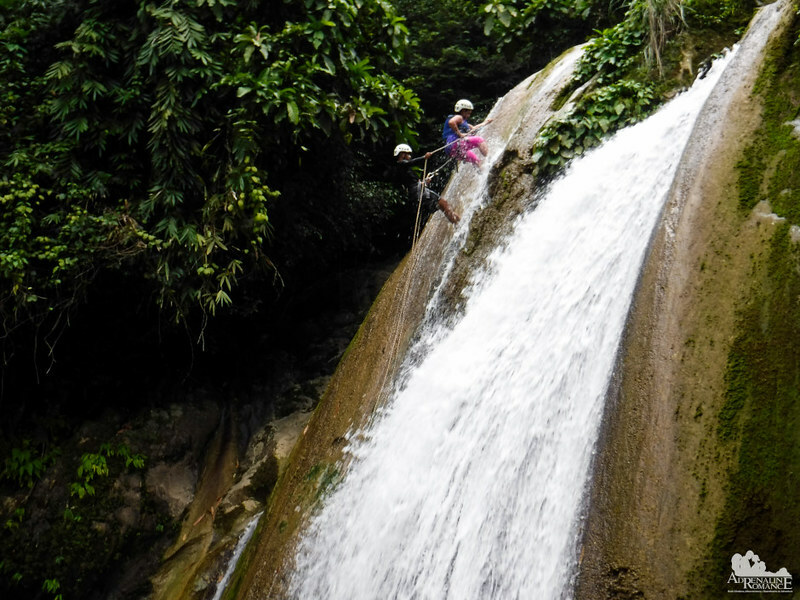 The waterfalls abseiling in particular looks really cool. I’d love to give that a shot! That’s correct. In fact, we are tech-poor people; we only have ordinary phones and computers. We don’t have tablets or high-tech gizmos. We are perfectly happy playing in the mountains, seas, rivers, etc. I love how you started this post, and I absolutely have the same opinion. I wish I can spend more time outdoors, with spring slowly approaching I hope I’ll have few adventures like you two! we’re planning to go there tomorrow , its a little late to ask maybe but not too late , my only concern is we’re planning to bring our own car , Avanza and Crosswind, how is the road from danao city to danasan? im talking about the road pavement and road windings… thanks to all in advance who can reply.